How many times have you got into a makeup store to fetch something & you just can’t keep up with what the salesclerk is saying about all the brands & types & benefits of each product? Many times, I’d say. What if you had someone with you that keeps repeating the things about the product without getting bored or tired? Cool, eh? This “someone” is what’s so-called “RFID smart shelves”. Bringing along a new era of business intelligence, as the interactive shelves are providing rather a unique and exquisite user experience. RFID smart shelves provides examples of how RFID can be integrated within the system as a foundation for inventory management. Estée Lauder is ahead of the game when it comes to innovation. Here’s the thing, Estée Lauder has integrated RFID-enabled kiosks to improve customer’s experience. All products are tagged by RFID tags, as they are sitting on the shelves, the RFID readers keep capturing each tag’s number. When a customer picks up a product from the shelf, the readers can no longer read the tags, triggering the software to play a video of the picked up product on a screen. The video stops as soon as the product is returned back to its place on the shelf. It is a smart system that doesn’t require any action whatsoever from the customer. Of course, this is a very useful approach as the business intelligence will be able to learn the customers’ behaviors and the purchase trends. These smart shelves interact with customers & allows Estée Lauder to track the effectiveness of its displays, by storing data on the server indicating how frequently tagged products were taken off the shelf. Indeed, this process saves a lot of time and effort for the customer will be provided with the information as soon as they pick up the product, without the need to wait for someone to offer them help. However, it’s more than just a products’ video displayer, there’s more to it than that. Beauty consultants can place a “Skin Consultant” tag on one of the shelves. When a reader reads the tag’s number, it triggers a camera that photographs the customer’s skin. 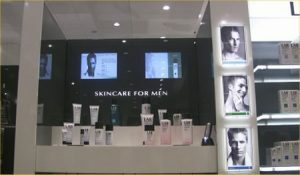 A magnified image of that person’s skin is then displayed on one of the screens, enabling the consultant to analyze the skin type and recommend products based on the results of that analysis. It is expected that RFID enabled smart shelves technology will become more common as it continues to prove its advantages. It is the doorway for a fully automated retail system that guarantees customer’s satisfaction & improved store efficiencies.